This is just kind of funny. My friend Cortney is a landscape designer, and one of the things I really love about her is all the cool stories she shares from her Google Reader. Most of these stories I just find cool or interesting, and it provides a different perspective to my RSS feeds which is heavily dominated by feeds on information management/business intelligence, technology, politics, parenting and food. Anyway, a recent blog she shared was an ad campaign where they put a picture of a bare tree (i.e. 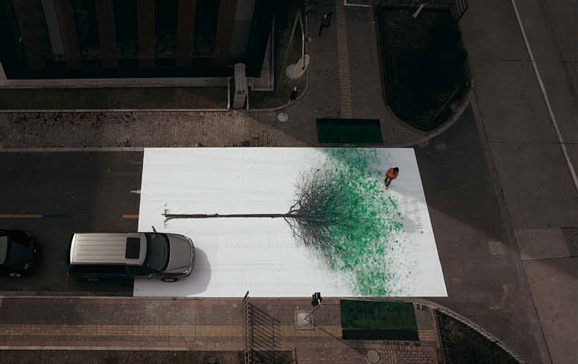 branches and trunk, but no leaves) on the road, and pans of green paint on either side of the sidewalk. Here’s the result. How cool is that? We all know the drill – we spend so much time going through our daily lives that we often miss the truly remarkable. As a result, there’s something strangely satisfying about a mass of people taking time off to appreciate something that could just as easily be missed because life is going too fast.